So you want to be a champion, huh? Of course you can! Achieving greatness is attainable each and every day. The only person who can stop such a thing is you. Being great starts by doing small things that’ll amount to big things, from the time you wake up to the time you go to sleep. Here’s how you can achieve greatness every day. 1. Say positive things about yourself. No matter how bad you feel about yourself or circumstance, be kind to yourself in all that you do. You’re human, so you’re going to make mistakes. Instead of beating yourself up over them, forgive yourself, make peace with it, speak a nicety and move on. 2. Read positive affirmations. The bible is filled with these. A great place to start is in Psalms or Proverbs, as they reaffirm God’s presence and role in our lives, as well as the freedom that’ll be ours when we surrender to Him. Additionally, authors like Deepak Chopra, Oprah Winfrey and Maya Angelou have an abundance of books filled with daily mantras and motivational scripts to get you through the day. Commit to reading a few positive affirmations every day for one week and watch how your mind improves. 3. Make plain your goals. This means write down what you think. Planning your goals may take some time, but once complete, you’ll have a blueprint on how to achieve greatness and success. Take it a step farther and pin your goals (and progress) on your walls so you can read them every day. 4. Be confident. Obstacles will come because that’s how life works. But through it all, you’re a champion who’s set out for greatness in everything you do. It will come to pass, girlfriends! 5. Keep going. Keep going. Keep going. 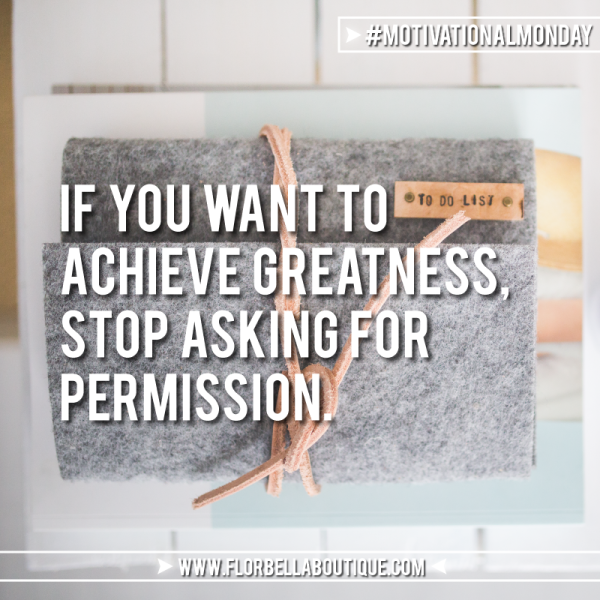 How do you achieve greatness? Share your tips with us in the comments or social media with hashtag #florbellaboutique.